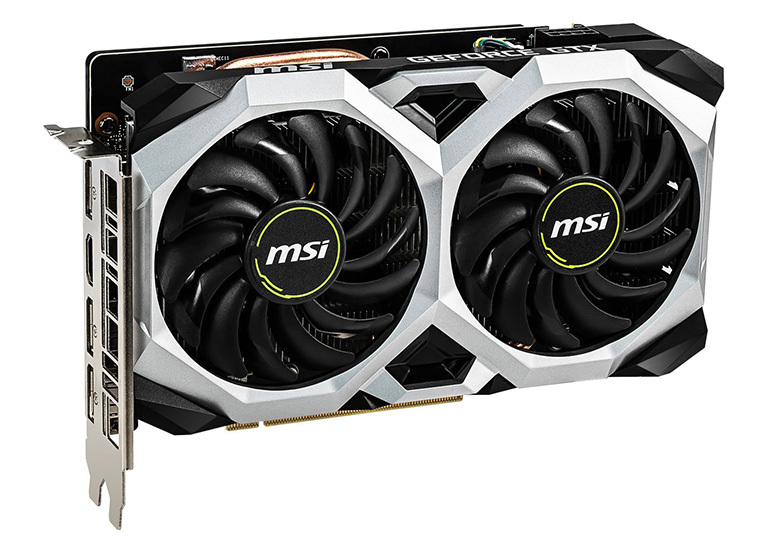 The Nvidia mainstream GPU stack of 2019 is finally taking shape following the launch of GeForce GTX 1660 Ti and GTX 1660. Based on the all-new Turing architecture but making do without the ray-tracing and tensor cores of the RTX line, these GPUs ship from £260 and £200, respectively. Understanding that pricing is key when a number of graphics cards play in a congested field, we reckon the pair makes most sense at their base prices, because as our results have shown previously, you don't receive a healthy dollop of extra performance by opting for a higher-spec model. All of Nvidia's partners have basic and premium models of each GPU in their arsenal. MSI hits the GTX 1660 Ti's MSRP with the Ventus XS OC. Let's take a look. MSI does plenty of things right straight off the bat. The card does indeed achieve the base £260 price point, isn't too large, has a core overclock in place, and eschews any form of lighting for a simpler aesthetic that's unlikely to offend in any build. Measuring 204mm x 128mm x 42mm and weighing 669g, the Ventus is a bit bigger than mini-ITX yet much more petite than triple-fan models that can be as much as 100mm longer. The shroud is constructed entirely from plastic and has enough angles and flared sections to offer a futuristic look. Ventus, it is good to know, doesn't feature a hybrid fan mode where the spinners turn off, though we're not concerned with that because the card is practically inaudible when doing not very much. You'll notice the card's height is a fair bit taller than the standard-sized I/O bracket. This isn't due to cooler overhang; rather, MSI uses a bigger PCB than is actually required. Knowing that the solitary 8-pin power connector is located along the top edge may cause the relevant PSU cable to brush up against the side panel on smaller chassis. Removing the heatsink is a piece of cake because it is held on by four screws. Doing so reveals a wider-than-normal PCB that's actually mini-ITX in length. It's the need to house this specific cooler that pushes the length out. MSI provides a specific heatsink for the VRMs and, going by the cooler, four thermal pads for the GDDR6 memory rated at 12Gbps. The single-heatpipe design - which makes good contact with the full-fat TU116 core - is disarmingly simple, though we feel the company misses a trick by not cooling the two memory chips at the bottom of the PCB. The rear section serves as a brace for the topside heatsink and is made out of plastic - the two combine to form a frame on the right-hand side. We'd normally like to see a metal backplate but view this one more as a protective cover for the rear of the PCB - there are no meaningful components to cool on the back. Most of the PCB components are visible from the side, including the thick heatpipe and rather ugly-looking 4-pin fan cable. As a consequence, much of the hot air is expelled back into your chassis, which is a trait the Ventus XS shares with many other budget coolers. 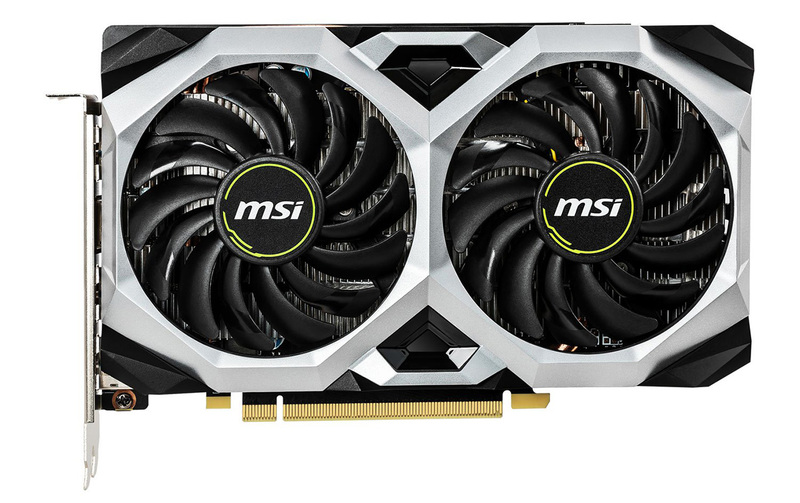 MSI sticks with the GTX 1660 Ti's 120W TDP yet also lives up to its OC name by increasing the boost speed up from a default 1,785MHz to 1,830MHz. We're impressed because even the fastest models of this card, costing over £300, are specified with a boost speed of just 1,875MHz. Kudos to MSI for offering an OC variant at the base £260 price. Our logs show that it runs at an average 1,905MHz under continuous load, meaning that performance ought to be within a per cent or two of the best 1660 Tis around. Why spend more if you don't have to? Outputs are modern and conventional, however, with a trio of DisplayPort and a single HDMI. Is there a case for keeping DVI for older monitors? 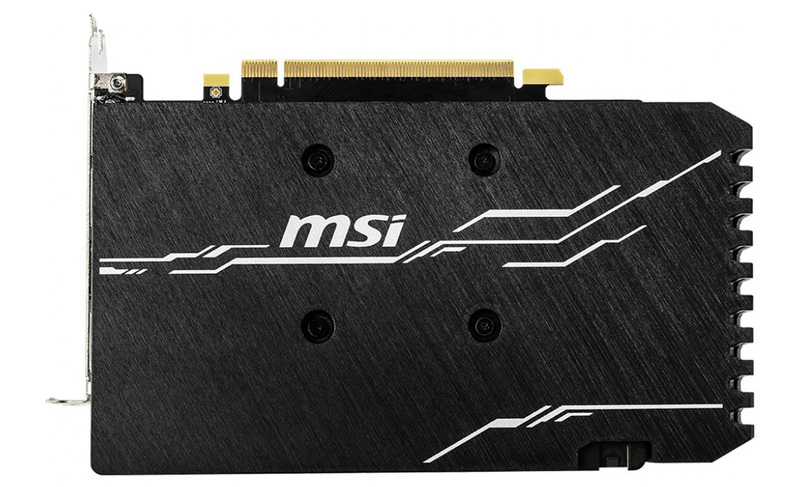 MSI backs the card with a three-year warranty that is good to see on an entry-level board. 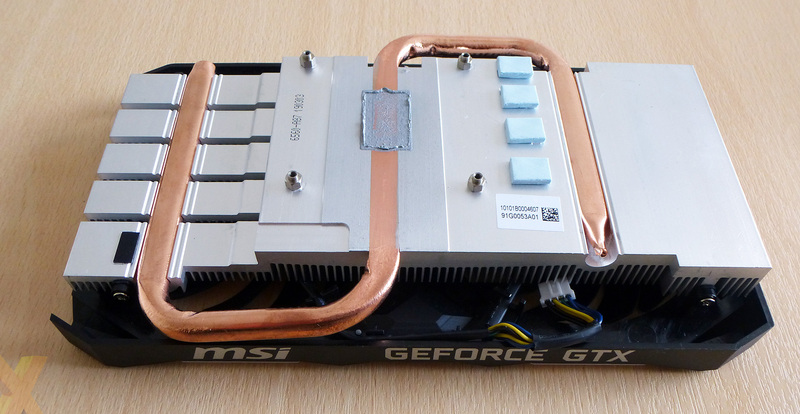 Sadly, neither Nvidia nor MSI offer a gaming bundle with this model.